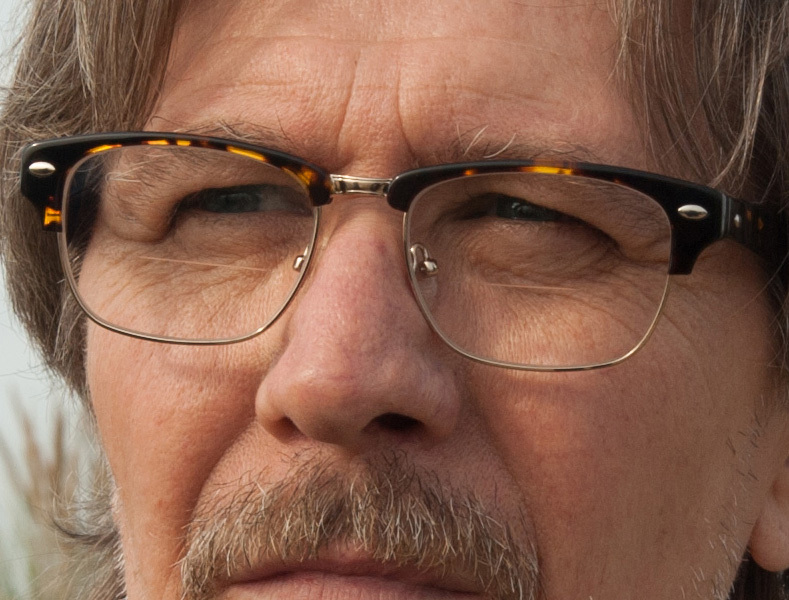 Gary Oldman seems to be wearing Ray-Ban 5154 Clubmaster Optics or similar eyeglasses in the movie Criminal. These browline eyeglasses with semi rimless frame have a tortoise color, and a gold color metal. The details of the rivets one the sides and the shape of the tortoise frame and the nose pads are slightly different from the Ray-Ban Clibmaster, so it might be another brand and model, but the Ray-Ban 5154 Clubmaster Optics are almost identical. Note that the Ray-Ban comes in different colors, with tortoise / gold frame (Red Havana, code 2372) being the most similar, but other options are Black Tortoise / silver frame (code 5491) or Blue Havana / silver frame (code 5492). Find these options on FramesDirect.com ($148 incl. lenses). These frames are also available as sunglasses, the Clubmaster model number RB3016 (as seen in for example the movie Reservoir Dogs). A similar model is also the Shuron Ronsir, which has appeared in many films.